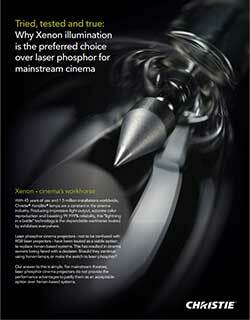 Xenon lamps are the workhorse of cinema. It is a proven, familiar technology with established workflows. Exhibitors know the performance, service and cost expectations; employees are able to perform lamp changes themselves; and audiences are accustomed to the visual quality produced by Xenon illumination. 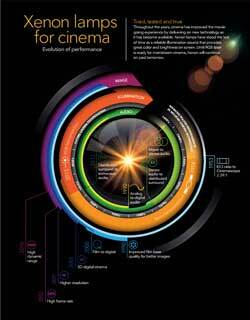 It is currently the ideal light source for theatres requiring up to 35,000 lumens of light from their projectors. Developments in lamp engineering and improvements in best practices have resulted in lower costs, improved performance and an operational life that offers exhibitors 99.9% reliability. It is the tried, tested and true light source.